In fairytales, princesses live in palaces. These beautiful, jewel-bedecked palaces contain all the precious dainties that a young lady might desire and shield their delicate minds from mundane and worldly experiences. Princesses are often forbidden to leave the grounds of said palaces and must wait to be rescued by their prince, while any hint of curiosity results in them being cast from the royal bosom into the chaos of the peasant masses. Where does this leave the princesses of the twenty first century, who reject utterly the notion that any sort of prince is necessary? What if they love the luxury of the castle, but are tempted by the sights and sounds of the city? How can they have the best of both worlds? 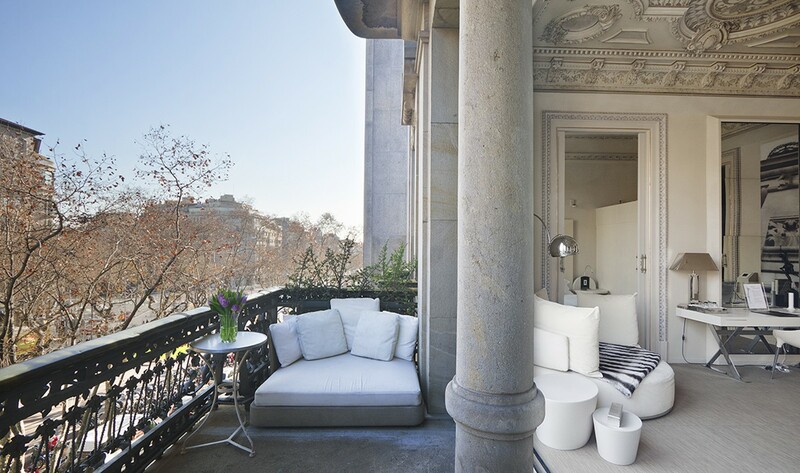 El Palauet (‘the palace’ in Catalan) is nestled between luxury boutiques in an enviable location conveniently close to the junction of transport artery roads Avinguda Diagonal and Passeig de Graçia, which makes it the ultimate base from which to explore this unique city. The imposing façade is in the modernist style, with a healthy nod to the baroque, but it does nothing to prepare you for the mishmash of styles that exist inside; there is even a modern, exclusive spa on the roof with sauna, hot tub and massage room. The huge lobby space – itself a warren of several rooms – is dominated by an enormous, wooden staircase and contains a huge chandelier constructed from 14000 pieces of Bohemian enamelled glass. There is no sense of a single reception area, or a reception desk such as you might find in a hotel, but more on that later. Guests use a rather nifty keycard system to access the lift and the suites (all rooms are two bedroom suites of 150m²), but it’s worth noting that the lift itself has sensor-activated lights and a mirrored floor, which creates an alarming blackness that looks remarkably like a gaping lift-shaft and necessitates a tentative prod with the foot before use to ensure that the lift car is, in fact, present. Upon arriving at the suites, however, all is light. 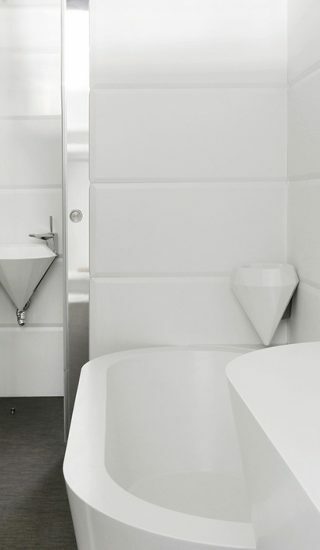 The suites are designed in a contemporary modernist style that combines clean, practical lines with organic detail. 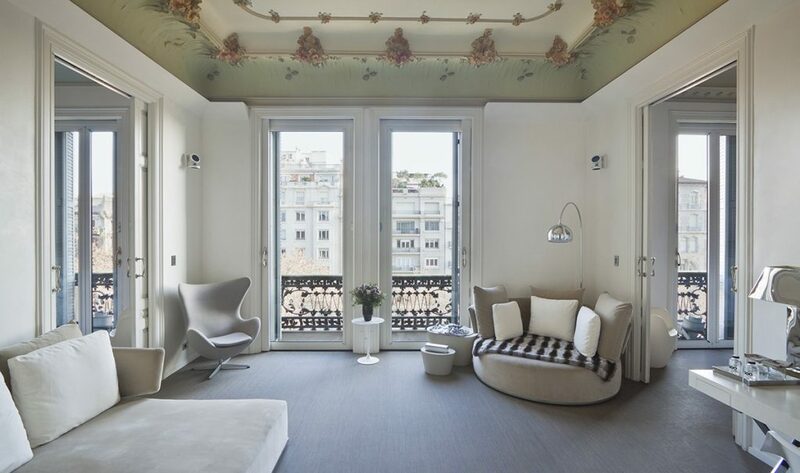 With wide, shuttered windows, our suite looked onto Passeig de Graçia from the living area, as well as from both bedrooms, which were located on either side. Ample seating in muted neutral tones reflected the pale shades of the ornate stucco ceiling, while other furniture and linens were all white. There is a kitchen with a full range of modern appliances, including mini-hob, oven, sink and fridge which means that the suite could comfortably sustain self-catering living, if one wished. The technology must have a separate mention. Aside from a TV in each room, a DVD player and a coffee machine, the suite has clearly been sprinkled with magic dust from the tech fairy. From a panel in the living area, one can control the blinds, lights and temperature of each room individually. For the Bespoke princesses, this was a blessing, as we do not often agree on the perfect sleeping climate. 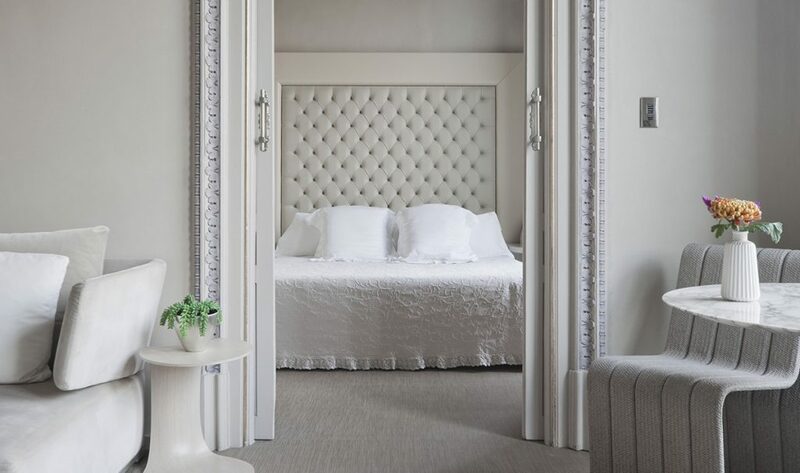 Buttons in each ‘zone’ allow guests to select specific lighting configurations and one can listen to music throughout the suite via an iPod dock or the music library. 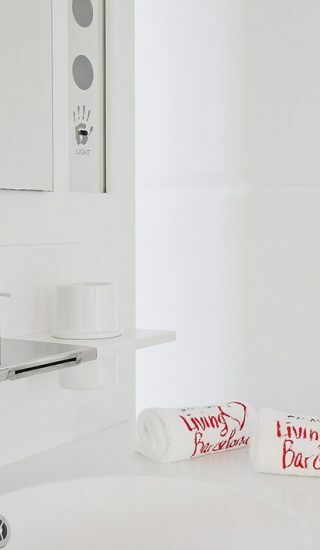 Each bedroom had an ensuite, one with a bath and a toilet area that could be separated from the ensuite by sliding door and made available to guests through a door in the dining area (possibly a strange choice, but the use of space is quite remarkable otherwise). Both showers are entered as though entering a spiral (a favourite modernist shape); both have the biggest rainfall showerheads I have ever seen and an amazing chromatic light show that we discovered by accident while pushing a foot-button in the dressing area. The multi-coloured lights did, however, turn off completely for a good minute as part of their cycle, so make sure you shower with a separate light source if you’re scared of the dark. With these luxurious surroundings, a princess might feel that she would never wish to leave, but some of Barcelona’s must-see tourist activities are very close by… Unaccustomed to the hands-off approach that El Palauet has taken, we felt somewhat furtive in leaving to do some sightseeing. There was no big send-off as one might get at a traditional five star, no good wishes for our day, not a soul visible in the capacious lobby to check everything was ok with our suite. At that time, it was strangely refreshing. 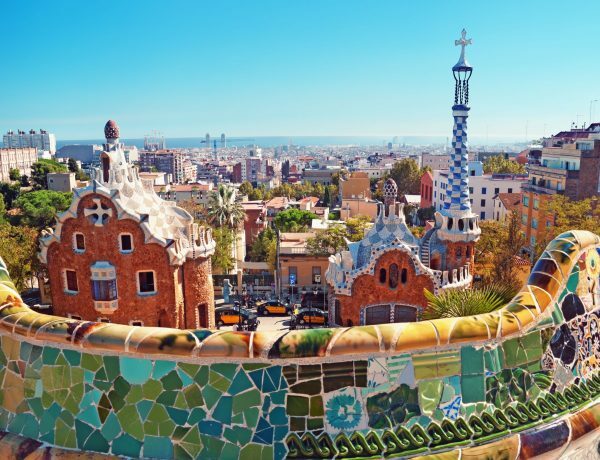 A short taxi ride or metro journey (Diagonal to Vallcarca, then a short walk) will get you to Parc Guëll, one of the modernist creations of one of Barcelona’s most cherished sons, the celebrated architect Antoni Gaudí. The Parc is an odd mixture of playful gingerbread fantasy houses, crooked neo-Classical columns and grotto-like shaded promenades that recall the uneven curves of organic shapes. At the Parc, one can admire Gaudí’s use of the trencadís tiling technique, which involves smashing up ceramics or glass and putting them back together in mosaic patterns. 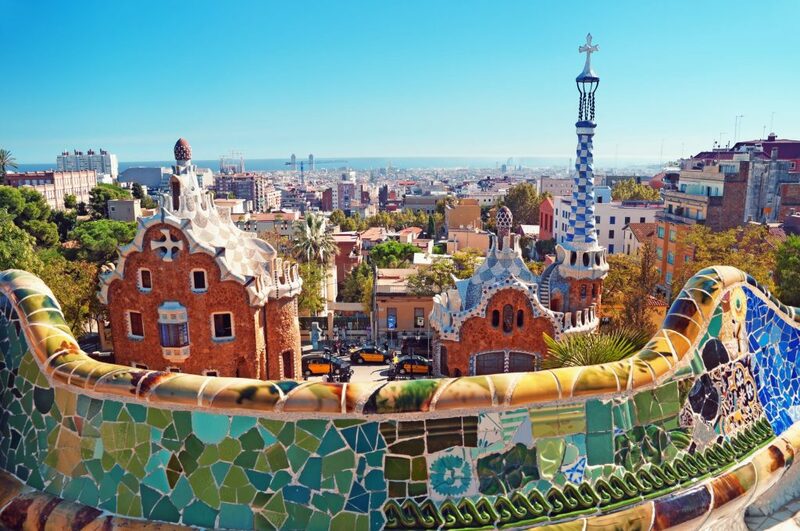 His famous lizard in this style appears at the Parc, but the technique can also be admired at some of the other Gaudí-designed buildings; Casa Milà (La Pedrera) and Casa Batlló are easily reachable on foot from El Palauet, heading in the direction of the famous La Rambla and the sea. The highlight of any Barcelona trip is definitely Gaudí’s masterpiece, the Basílica i Temple Expiatori de la Sagrada Família (Sagrada Familia for short). Construction continues, even 90 years after Gaudí’s death, with an entire façade of the structure and several enormous spires, some of which will dwarf those that are already finished, still to come. The audio guide is worthwhile, but make sure you also turn it off and take some time for quiet contemplation. The interior is a kaleidoscope of colour, especially if you can time your visit to make the most of the sun’s position low in the sky, stained glass abounds and towering columns branch out like trees that stretch towards the bright skylights at the very top of the cavernous space. It’s breathtaking, an experience that is awesome in the religious sense, even for the staunchest of atheists. Fully sated from our whirlwind of Gaudí, the princesses returned to our own modernist wonder at El Palauet. The absence of staff was, this time, less refreshing. After loitering in the lobby for fifteen minutes, with the aim of asking where a good restaurant might be found (some suggestions are provided in the room, but nothing on their list took our fancy), we eventually spoke to someone. Perhaps there was a number that we could have called from the room, but no one had told us what it was. Upon checkout the following day, we were assisted in carrying our bags to reception and informed that someone would check us out shortly, but we had to wait almost half an hour for this person to appear. With the perfection of the suite, the ideal location and the luxurious night’s sleep we had enjoyed, it was unfortunate that this was our experience of departure. 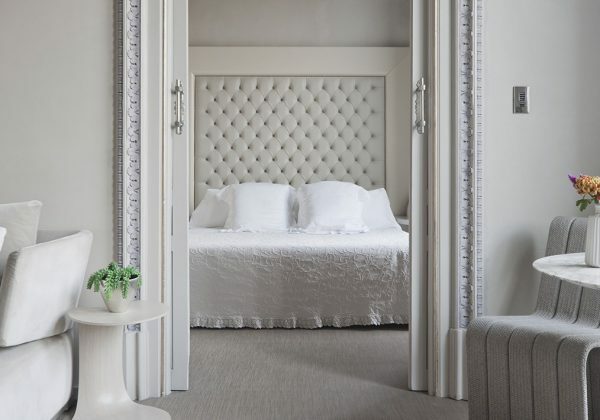 El Palauet is certainly a palace fit for a modern-day princess. A whole wealth of services can be arranged to pamper you (hairdresser, makeup artist, personal shopper) and the concierge is able to book tickets or make suggestions for cultural and dining experiences. 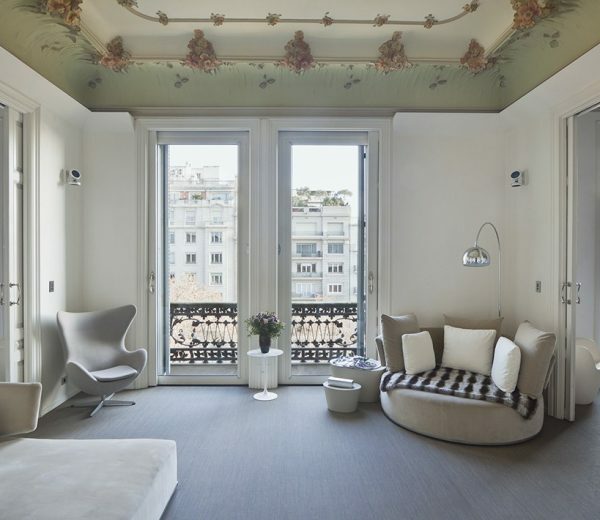 With the keys to your own fully-equipped accommodation in the very heart of Barcelona, the city lies in every direction waiting to be explored. This palace is gilded, but it’s no cage and the princess can come and go as she pleases, enjoying a kind of five-star self-catering that leaves you completely to your own devices. In this palace, you can cook your cake and eat it too.